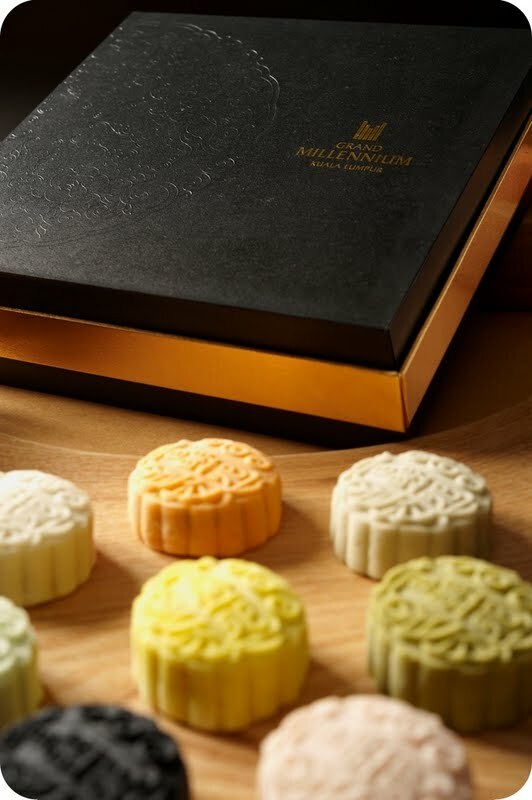 Lai Ching Yuen, Grand Millennium Kuala Lumpur: A Reunion Festival with Lai Ching Yuen’s Mooncakes! Over the Moon with Chef Thye’s Mooncakes! Mid-Autumn Festival or the Reunion Festival is traditionally celebrated on the fifteenth day of the eighth lunar month which is in September or October. The festival is the second most important festival after the Spring Festival to Chinese people. Every year, when the festival comes people go home from every corner of the country and the world to meet their family and have dinner with them. It’s no secret! Grand Millennium Kuala Lumpur serves one of the best Mooncakes in town. Back for more this year, I was extremely pleased to see classics among bold new flavors. 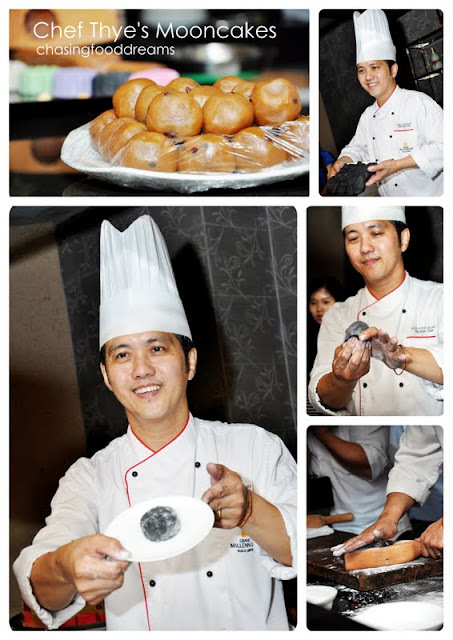 Grand Millennium Kuala Lumpur has created an array of traditional and mini snow skin moon cakes alike. Celebrate this Mid-Autumn Festival with friends and family and savour on homemade mooncakes made by Chef Thye Yoon Kong. One can be assured of lavishness when it comes to Lai Ching Yuen. Serving nothing but the very best, this year’s mooncake collection has five varieties of Baked Mooncakes and eight varieties of Mini Snow Skin Mooncakes. Savor authentic traditional recipe from Assorted Fruit and Nut, Red Bean Paste to Pure White Lotus, or Pure White Lotus with Single Yolk. For a contemporary taste, there is always the Mini Snow Skin Mooncakes series featuring a luscious array of new flavors of Mini Snow Skin Mooncake with Passion Fruit Lotus Paste, Mini Snow Skin Mooncake Durian Lotus Paste, Mini Snow Skin Mooncake Spiruline Lotus Paste or Mini Snow Skin Mooncake Green Tea Lotus Paste. We also had the honours of participating in Chef Thye’s Mooncake Making Session! You know a professional when he deftly mixes, wraps and moulds the mooncake with such suaveness and grace. Voila!! Check out the happy and proud faces with their masterpiece! Catch a glimpse of Lai Ching Yuen’s infamous Chinese offerings. Renowned for exceptional quality and refine Cantonese cuisine, dishes at Lai Ching Yuen is an exceptional gastronomic experience. The restaurant is also highly regarded with serving one of the best dim sum in town. Dinner at Lai Ching Yuen is also a sensory sensation since the ambience and service is truly grandeur and discreet. Kicking off the evening with a traditional must-have in every Cantonese household is Double Boiled Chicken with Clam and Cabbage Soup. A glorious piping hot broth of soothing comfort befits the evening’s moment of simply winding down the day with great warmness. Superior broth was laced with a beautiful sweet scent of cabbage while chicken and clam provided additional meat flavours. An appetizer of simply Deep Fried Golden Mushroom was definitely lovely. Light and easy, the skinny strips of crisp mushrooms make a perfect snack anytime! A favourite among foodies was Deep Fried Soft Shell Crab! Succulent morsels of crispy soft shell crab were perfected with a light golden batter. One would enjoy these crisp and juicy bites of the crab with a good beer or even wine. I was definitely in loved with the Barbeque Roasted Pork with Honey! Caramelized and charred bits in the roasted pork exuded a sensory porky goodness that guarantees to reel in happy thoughts. Leaner than most BBQ pork, the tender meat was nicely sweetened with honey while aromatic soy sauce also dominated the flavours. Give me a bowl of steaming rice with the BBQ pork to complete my day! It’s definitely a clean and elegant dish with Homemade Beancurd with Angled Luffa Gourd and Scallop! 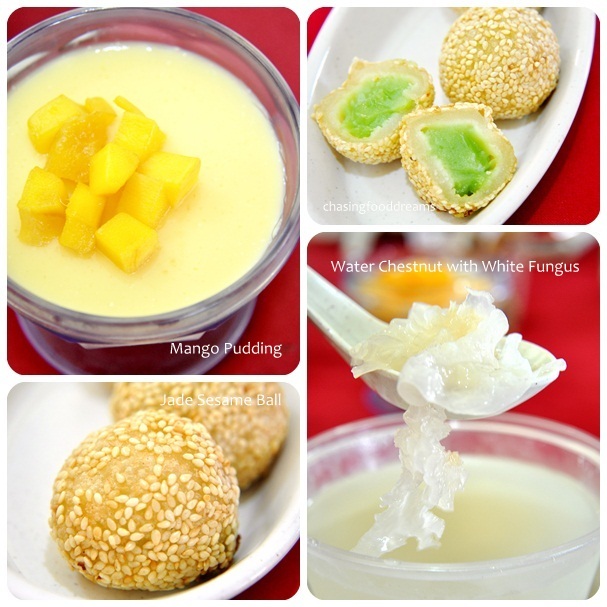 Silky smooth egg beancurd showed off the naturally sweet angled luffa gourd and fresh chunks of scallops. Dotted goji berries added colour and scent to the simply but delicious beancurd dish. From light and clean flavours, we hit the jackpot in taste with Braised Bamboo Fish Head in Clay Pot. Deep fried fish head pieces had soaked up the deep amber gravy like a sponge. Sucking off all the flesh and skin was an enticing moment as the gravy was simply flavourful and rich. Pieces of soft fried eggplant were also present to add further silky texture to the braised dish. Our green for the evening was a luscious Fried Australian Asparagus with XO Sauce. The exuberant XO sauce was spicy, pungent and rich with an oceanic flavour. Kudos to the chef for retaining the beautiful crunchy texture of the asparagus! Street food foodies would applaud at the Loh Mee served at Lai Ching Yuen. Wholesome and rustic, the braised thick yellow noodles had the essential lardy bits that brought the dish alive. I had this with small dribbles of black vinegar for a refreshing sour kick to the eggy and savoury taste of the thick starchy broth. Ending the meal was a sweet dessert of Sea Coconut with Red Dates and White Fungus. Not too sweet, the dessert broth had lots of textures going on in every spoonful. Glorious platters of baked and mini snow skin mooncakes were a sight to behold! We savoured both sets of Fortune Mooncakes featuring the baked mooncakes and Full Mooncake Gift Box featuring the mini snow skin series. Baked Mooncakes are delicate and well make with a gold and thin skin wrapping up rich White Lotus Paste and Red Bean Paste. I was particularly fond of the rich salted egg yolk in the mooncake here while the Assorted Nuts was laced with intricate flavours and textures. Mini Snow Skin Mooncakes are highly irresistible with its gentle but beautiful flavours this year! My favorites was the Passion Fruit Lotus, Pure Dates Paste and Green Tea Lotus Paste. Despite its gentle flavours, the mooncakes are richly luscious in taste. I also heard that the Durian Lotus Paste was a favourite that night! Fortune Mooncake Gift Box priced at RM 112.00 ++ per box of 4 item and Full Mooncake Gift Box priced at RM 108.00 ++ per box of 8 items are for those who plan to bring home some sweet endings for their family members. Grand Millennium Kuala Lumpur also has offer for those who prefer to pack for a simple reunion where one can select from a selection of mooncakes starting from RM12.800++ per piece to RM29.80++ per piece. Lai Ching Yuen is a non-halal Chinese restaurant located on the first floor and it is open daily from 12 noon to 2.30pm for lunch and 6.30pm to 10.30pm for dinner. For reservations, please call +60 3 2117 4180 or email lcy@grandmillenniumkl.com or visit us on facebook.com/laichingyuen. Yum Cha Affair at a Dragon’s Lair! No dragons found here but then again I am sure the mythical creature would not be missed here! 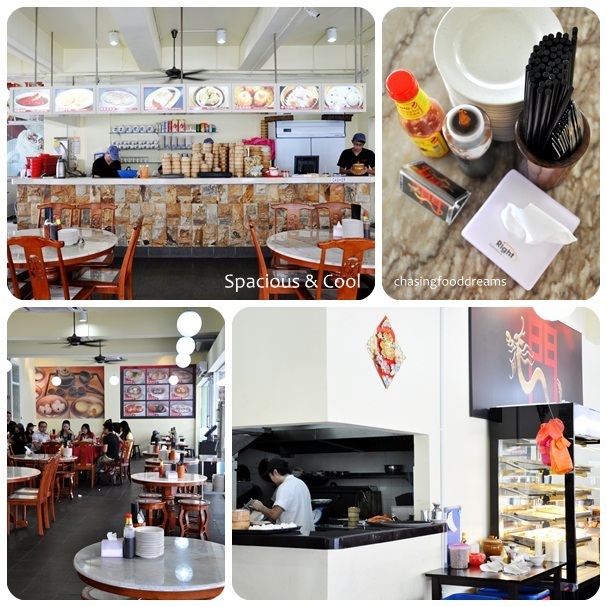 Our usual foodies rounded up one weekend morning and met up for a yum cha session at Dragon Gate Restaurant at Kota Damansara. A boldly named restaurant, Dragon Gate has only been around less than a year. Boasting a local chef who learned the art of Dim Sum from a Hong Kong Dim Sum chef, Dragon Gate Restaurant offers quite a list of dim sum variety with lots of classics and a few creative newbies. The ambience at the restaurant is really bright and quite spacious with lots of natural lights and coolness. Al fresco area is also available if one insisted on dining ala naturel. Huge posters of dim sum are strategically placed all over the restaurant to make one salivate at its offerings! A long bar parallel to the dining area offers customer a peek at the operation of the restaurant while stacks of baskets are seen stacked neatly in one corner to remind one of the nature of the restaurant. Marble table tops are displayed with essential utensils and sauces for self service. I could see lots of wait staff scurrying around busy as a bee! A hot warmer display is laden with loads of fried goodies, beckoning everyone entering the restaurant to head over to check out the samples. One interesting point at Dragon Gate is that they also serve a minimal list of beverages like Ice Coffee or Tea, Herbal Drinks, and Tong Shui in addition to the usual Chinese Tea. I just couldn’t resist and ordered an Iced Tea. My Iced Tea was quite lovely as it had a fairly thick and creamy concoction of refreshing tea. It tasted so good that I finished this in a jiffy! Others had herbal beverages like chilled Sea Coconut with Longan and Sugarcane with Water Chestnut. I also tried the Sea Coconut and thought it was decent. In every dim sum meal, my two ultimate favorites will always be Siew Mai and Har Kow. In anticipation of the two classics, the Siew Mai was only mediocre while the Har Kow fared better. I simply prefer my Siew Mai to exude more bouncy texture with a great savory taste. The one here was smooth in texture and flavor was average, lending the overall to be not as par to my usual benchmark for the classic dumpling. Har Kow or Shrimp Dumpling fared better with a good thin translucent skin encasing a fresh amount of shrimp filling. Lovely in flavors with a hint of natural sweetness from the shrimp, the Har Kow was snatched quickly by the gang. Siew Mai with Salted Egg was decent but not particularly memorable. A bit more rustic compared to the classic Siew Mai, this one had light hint of the glorious salted egg yolk. Maybe more salted egg would perk up this one! While the classic fell short, others were good on its own merit! Leading the scrumptious lot of the dim sum was Bacon Rolls with Honey Sauce, featuring three superb rolls of lardy delight. Strip of bacon delicately wrapped around a minced fish and prawn filling and bathe in a sweet honey sauce is the ultimate morsels of flavors at Dragon Gate. I also like how the bacon retains a subtle dense texture against the smooth filling of the seafood paste while the contrasting taste of salty bacon balanced out the sweet honey beautifully. Highly recommended on my books! Shanghai Xiao Long Bao is considerably good here at Dragon Gate. Yes, certainly not at par with other Xiao Long Bao specialist but for a dim sum restaurant, it fared good in terms of the thin skin engulfing a broth of meaty filling. I didn’t count the essential 18 folds of the soupy dumpling but it passed with a degree of goodness… wink! Cabbage Dumpling is simply adorable at sight. A bundle of sweet flavors from the hints of vegetable and shrimp filling, this one fared pretty good in texture, flavors and presentation. My partner is a huge fan of Steamed Fish Ball so he regards himself as a connoisseur of the dim sum. This one rated decent for him but again far away from his own benchmark of fish balls. I stole a small bite and thought it was decent. There is a light bouncy texture and portion wise was deemed large compared to others I had before. 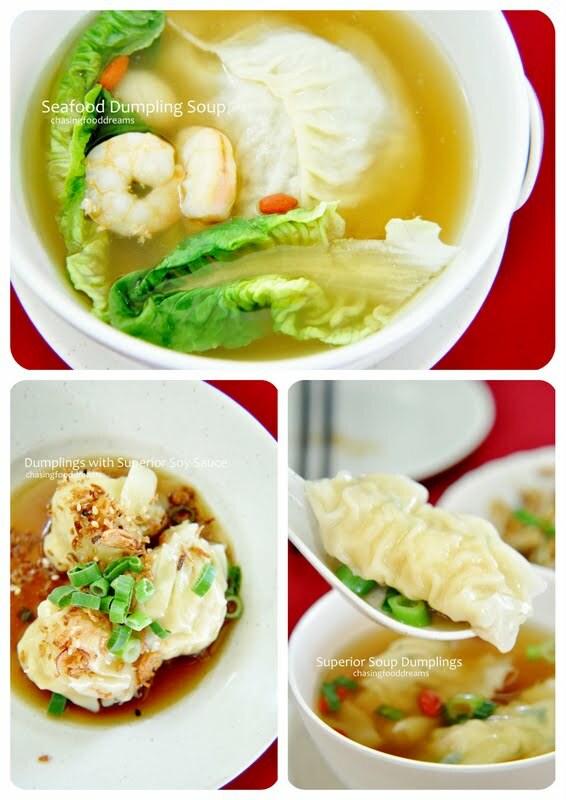 Superior Soup Dumplings and Seafood Dumpling Soup both features stuffed Sui Kow served in a light golden broth. Both dumplings may look the same but tasted differently due to the stuffing and size. The regular Sui Kow had again a fine minced filling while the large Seafood Dumpling was stuffed to the brim with a variety of minced seafood. For the price tag it came with, I certainly have no complaints on either dumplings. Dumplings with Superior Soy Sauce also featured the similar Sui Kow but this time soaked in a superior soy sauce and sprinkled with fried shallots and sesame seed. An aromatic one, the dumplings had the distinctive taste of the lovely soy sauce and shallot flavors, lifting up the flavors another notch compared to the earlier Sui Kow. Steamed Pork Ribs was so delicious, we had to order two more! Executed perfectly, the pieces of meaty ribs were tender, moist and pumped up with a moreish flavor. I adored the meat tremendously laced with lots of umami flavors and a hint of black bean. It was unanimous that we could not get enough of this dim sum! Not a fan of chicken feet, I only heard positive feedbacks on Stewed Chicken Feet from others. From appearance, it did look really appetizing and chicken feet lovers did praised its portion of nicely stewed tender chicken feet. Not a usual dish found in every dim sum outlet, I have to commend Dragon Gate for the Herbal Chicken. A large basket held a foil packet of herbal steamed chicken guaranteed to entice one’s nostril upon the opening of the packet. Pieces of tender chook had a good boost of herb flavors while retaining its moist and sweetness. The chef is very generous with the amount of herbs hence the dish is really praiseworthy for those who love a good herbal soup concoction. I did savor spoonful of the rich herb broth happily! 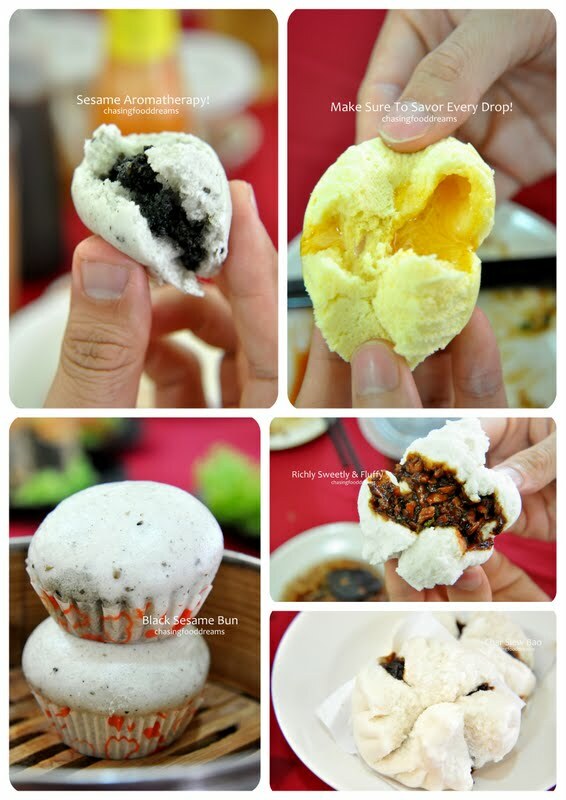 Limited choices of baos but sufficient to say, it has the few must-haves in any dim sum restaurant. Six choices ranging from classic Char Siew Bao, Lotus Paste, Red Bean, Pandan Kaya to newbies Black Sesame and Custard & Salted Egg Yolk. Char Siew Bao was indeed fluffy that day and filled with the typical Char Siew Filling. I preferred the Black Sesame Bun for its texture and aroma compared to the Custard & Salted Egg Yolk. I could never resist deep fried goodies, can you? Although not considered a healthy option of dim sum, still one should always leave a little room for some indulgence in small portions. In addition, if a good fry up is executed with fresh batches of oil and good heat, the dish is not as bad as it is deemed (heard about this in a food documentary television episode recently). Sweet Potato & Yam proved to be a delicious creation! Ordinary looking but filled one’s mouth with a lovely contrasting texture of crispy breaded shell filled with a creamy and silky filling of sweet potato and powdery yam. Well executed without a trace of oil, these little golden balls also got everyone’s nod of approval for its simplicity in flavors and textures. I would order this again for a revisit. My favorite fried dim sum, when done perfectly, was Radish Cake. Dragon Gate’ Radish Cake had high scores from me for its perfect crisp exterior and moist tender interior. I thought the flavors were spot on with a good taste of white radish. Well-fried, the radish cake was not oily at all but rather crisp and melt-in-the-mouth goodness all the way. Yum!! Essentially sumptuous was the Crispy Yam Puff, balls of crispy yam filled with sweet bbq pork filling. Scoring high points, the yam puff was fluffy and crispy with a creamy taste. Go ahead… order this to check it out for yourself. I didn’t manage to sample any BBQ Pies. It was only when it was finished, everyone raved about how lovely this one was. I did manage to capture how the layers of flaky pastry looked with the savory and sweet filling. Ok, I will take their word for it for this flaky pastry roll filled with BBQ meat filling and rounded up with pork floss. Beancurd Rolls with Shrimp had a repeat in orders when we found out how delicious it was. Light, crispy and filled with juicy sweet shrimp filling, its best eaten hot with a dab of mayonnaise. I had mine with mustard and chili sauce that was quite sensational despite its simplicity. Wasabi Shrimp Ball is the inherited touch of Japanese cuisine that made its way into our Chinese one. It’s the wasabi sauce with that tingling sensation at the back of the nose that makes this dim sum appealing. Other than that said, the shrimp ball was ordinary. 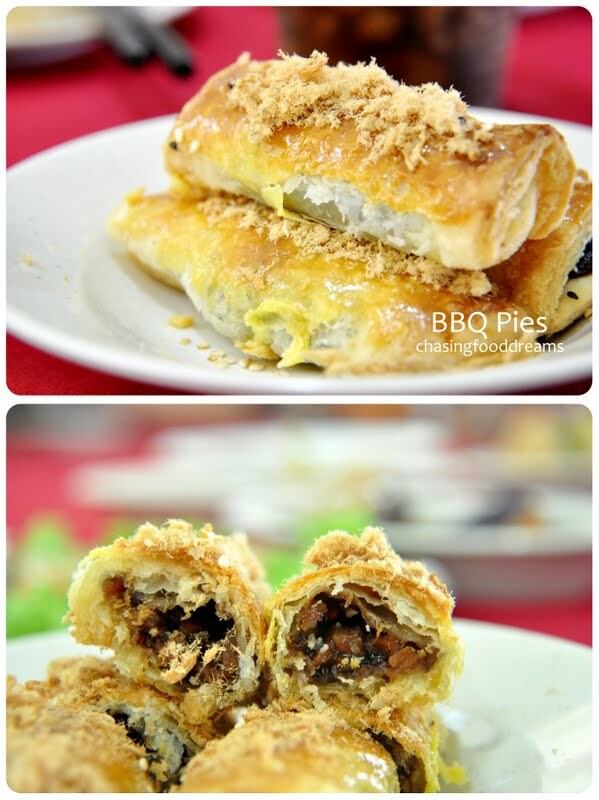 Between the both, I seemed to prefer the lighter Beancurd Rolls with Shrimp. I thought Shrimp Rolls with Mango was a great combination! The sweet mango lightens up the sweet shrimp paste while the crispy texture was delicious against the soft and subtle filling. I do agree with another foodie’s comment that they should put a bit more mango in the roll for a stronger hint of fruitiness or even a sweet Thai chili sauce for a boost of flavors. Other than that said, it’s a nice dim sum for a variety touch. 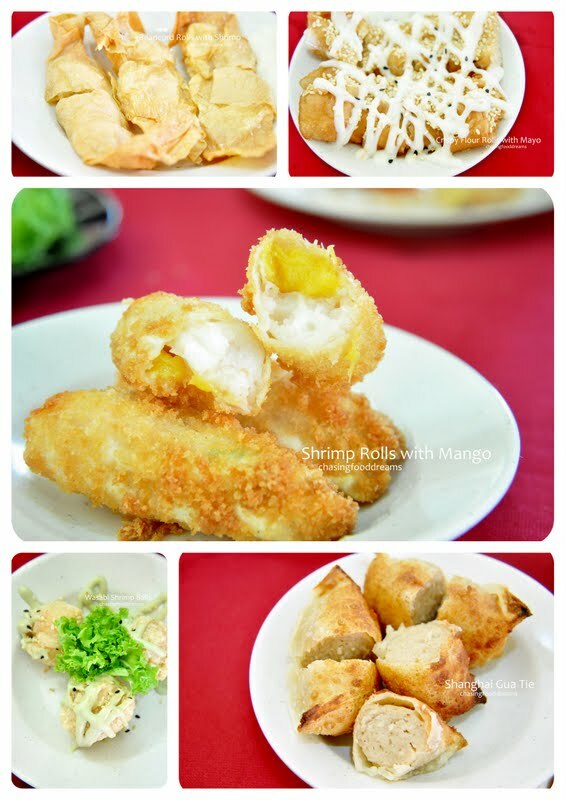 Crispy Flour Rolls with Mayo is fried You Tiao stuffed with shrimp paste and doused with liberally mayonnaise. I couldn’t taste much shrimp filling and thought the mayonnaise overkilled the dim sum. Sometimes less is more, so less mayonnaise and maybe a bit more shrimp paste in this one would up this dim sum several notches. Pan fried Shanghai Guo Tie also faired mediocre at best. Plump and pan seared nicely, the fried dumpling was decent. Phoenix Shrimps with Seaweed sounded glamorous. Rolls of crispy seaweed laver enveloped shrimp paste and studded with a shrimp provided an oceanic aroma of the slightly woodsy seaweed with the sweet shrimp paste. Fairly moist, the rolls were easy to devour. 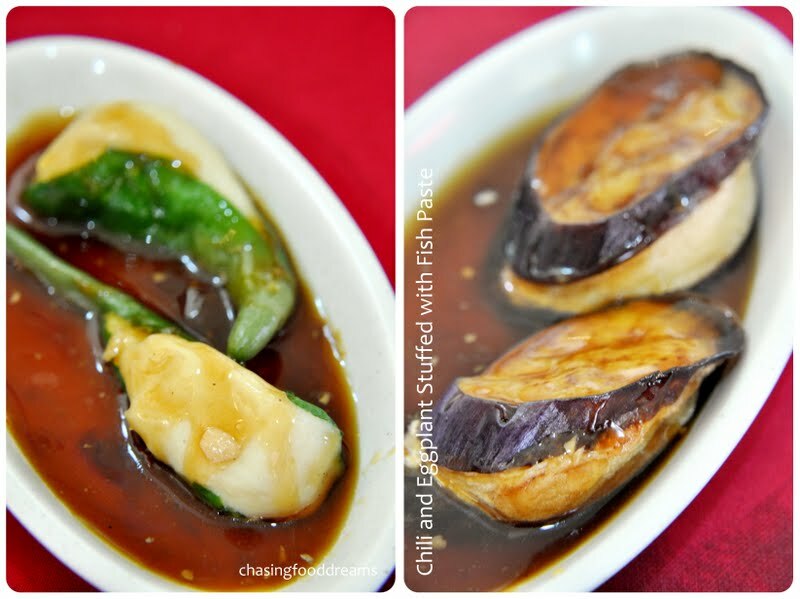 Yong Tau Foo is always a classic appearance at any dim sum place and over at Dragon Gate, minimal choices like Eggplant Stuffed with Fish Paste and Chilies with Fish Paste are available as well. Shanghai Fried Rice Sheet with Shrimps is an unusual find at Dragon Gate. I gathered that one will either like it or not as there is a unique texture to this dish. Resembling chewy wide strips of translucent rice noodle, this is stir fried with egg and prawns. I liked this as the slightly chewiness of the rice noodle provided a good bite while savory flavors were decent. I would ask one to at least try this creation since it’s quite unusual. Steamed Hong Kong style Chee Cheong Fun is always a must-have for me. There is just something comforting about freshly steamed soft rice noodles with shrimps and a superior soy sauce. While the original is available, one gets a few varieties of Cheong Fun here. Check out Spinach Cheong Fun with Shrimp or Char Siew, Mixed Cheong Fun, Cheong Fun with Flour Rolls and even Cheong Fun with Scallops! Fried Radish Cake with XO Sauce was a masterpiece! Cubed pieces of radish cake were well seared and coated with tasty egg while loads of crunchy bean sprouts and chives perfumed this dish heavenly. I also tasted a good hint of aromatics of the spicy XO sauce enhancing the radish cake deliciously. A Must-Order at Dragon Gate! Glutinous Rice Village Style was not too soft but retained a nice sticky rice texture. Certainly well-seasoned with the essential sweet and tasty dark sauce together with the chicken, mushroom and Chinese sausage, one may concur that a bowl is not enough. Rustic and authentic, it’s really very likable at first taste. 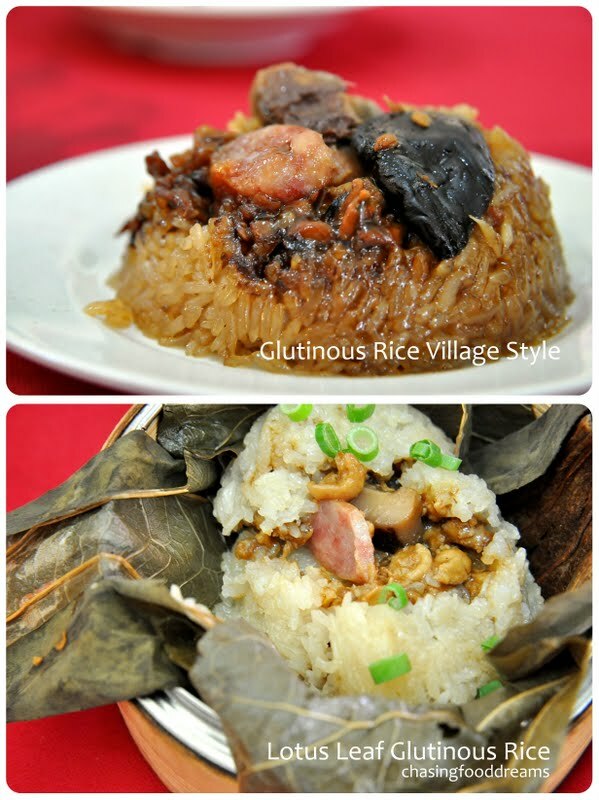 There is also the Lotus Leaf Glutinous Rice where the large dumpling unveiled a white version of glutinous rice stuffed with a sweeter sauce and filled with more goodies like minced meat, dried shrimp, Chinese Sausage, mushroom and more. Whenever I patronize dim sum eateries, Egg Tarts is simply a must! A good testament for egg tarts is the flaky and buttery crust filled with a wobbly and silky soft egg custard. The version here fared decent with layers of flaky pastry though the custard was not as creamy as I hope for. Offering basic and minimal desserts, Dragon Gate has Jade Sesame Ball with Pandan lotus paste for the distinctive Pandanus aroma touch. I also enjoyed the Mango Pudding for its lightness and touch of cream. Cubed pieces of fresh mango added a nice finish while Water Chestnut with White Fungus is also a light and refreshing Tong Shui to round up the meaty affair. Rounding up the Dim Sum affair at Dragon Gate, the restaurant has a good variety of choices with essential classic dim sums and few creative ones. While there are some misses, diners may not even notice as there are really a few scrumptious dim sums in the list. Price is also considerably affordable so there really is not much one can fault at Dragon Gate. Dim Sum price range starts from RM3 to RM10. The ambience is also a plus point as it is really comfortable and fairly spaced out unlike more cramp and hot dim sum eateries.